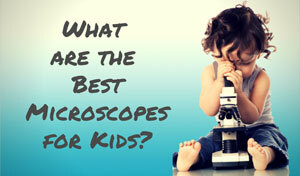 Celestron LCD Digital Microscopes combine an old idea with new technology. The result is a product that was an Innovations 2009 Design and Engineering Award honoree for personal electronics by the Consumer Electronics Association. 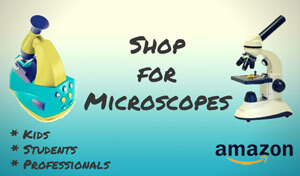 This is a compound biological microscope with a 3.5-inch to 4.3" touch LCD screen depending on the model purchased. 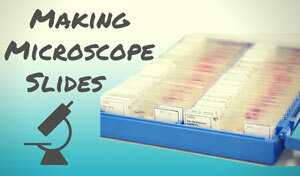 Instead of using the traditional eyepieces, your object will display on the screen. This could be anything from yeast and bacteria slides to insects and stamps. There are many advantages to having an LCD screen over eyepieces. Specimens are much easier to see, and more than one person can view a slide at the same time. This makes the Celestron (44341 Microscope II, 44347 TetraView, 44348 PentaView, 44360 InfiniView) convenient for an adult to use, as well as more fun for kids. The display uses a built in digital camera, which allows you to take pictures or short videos as well. You can then save, share, or load these pictures onto a computer with the included USB cable. A nice feature if you want a photo of your mold culture as a desktop! Note the the Celestron 44340 has been discontinued and replaced with the Celestron 4431, a similar model that has an upgraded 1 GB SD card for saving 620 high-resolution images. The build in camera in the Celestron 44341 is now 5MP vs. the 2MP camera in the 44340. 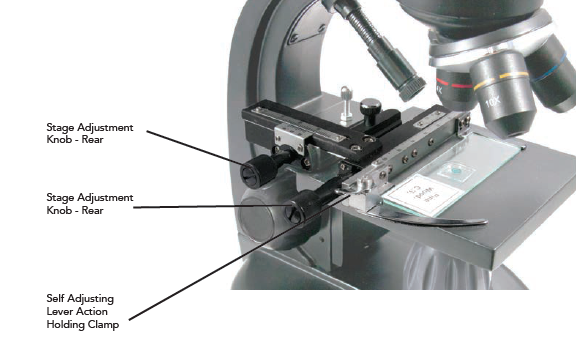 The Celestron LCD Digital Microscope comes with a lot of features, making it a great bang for your buck. It comes with three different objective lenses, allowing for magnification levels of 40x, 100x, and 400x. The LCD screen also has a 4x digital zoom, so objects can ultimately be displayed at 1600 times their original size. The LCD screen is of course the most enticing feature. No more eyestrain, no more neck strain, and no more kids fighting for a view through the eyepiece. The screen that comes with the Celestron 44341 is high resolution, and we found it to be both clear and bright. The technology of this digital microscope goes beyond just viewing. The built in camera is easy to use, and allows you to take pictures and short videos of what's on the screen. At 5 Mega Pixels you get a pretty good picture, one that you can store and send to others later. One of the features that makes these good pictures possible is the lighting and brightness controls. It comes with top and bottom LED Illumination, which is excellent for viewing transparent or lightly colored slides. More opaque objects may benefit from having additional lighting nearby. It seems the most common complaint from consumers about this microscope is that some models come with a dark "spot" on the display screen. This didn't occur on the model we tried, and the Celestron 44341 LCD Digital LDM biological microscope comes with a 2 year limited warranty. So if you have any issues, you can return it for another model. In addition to the warranty, it also comes with five prepared slides, a USB cable for transferring images, and a carrying case. Not too shabby for under $200! 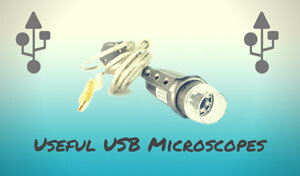 Simply put, you won't find a budget LCD digital microscope like this one. Note that we say budget, so keep in mind that you're not going to get a professional instrument for one tenth of the price. The dark smudge in the center of the LCD screen does continue to be a problem. The majority of users do not report this, and Amazon.com or Celestron will easily accept returns. Another occasionally reported issue is dim lighting. However, keep in mind that this is a biological microscope, and is meant for transparent slides rather than more opaque ones. 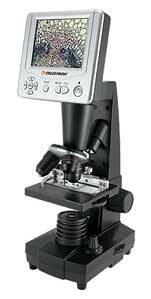 Overall, the Celestron LCD Digital Microscope 44340 is a good microscope for the price. The magnification is excellent, in most cases the screen is very clear, it's easy to use, and the ability to take pictures and video adds a whole new level of fun and intrigue. 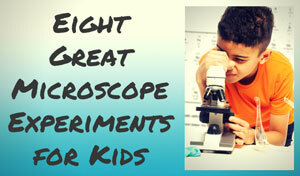 Recommended for: Educators, school aged kids, curious adults on a budget, anyone with eye problems. Not recommended for professional laboratories or high-level med students. The Celestron 44340 is discontinued, but can be purchased for a bargain price on Ebay. The Celestron 44341, can be affordably purchased on Amazon for about $50 more than the older model.